Some olive groves are on such a grand scales it takes forever to spray them, wearing out tractors and sprayers in the process. Farmers who are sick of the number of refills and the unreliability of their current olive sprayers would do well to try the new Mercury Olive Mistblowers from HARDI Australia . Built strong with a 4000 litre tank and chassis, they have plenty of rubber on the ground for good flotation and decent mudguards that are big enough to stand on. The blower has straightening vanes on the way in and olive deflectors to direct the air on the way out. 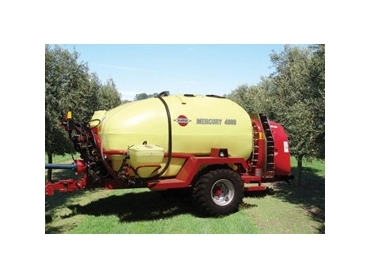 Two rows of nozzles on either side of the olive deflector allow you to double or halve the application rate on-the-go. The blower may not measure quite as wide as some on the market but it will reliably out perform them. This is one blower where the “size-matters-rule” doesn’t count. Utilising aerodynamics the study of air motion, is why the HARDI blower design has been able to offer a better air distribution and higher air flow with lower horsepower consumption. The demo Mercury is set up with vegetation sensors, not too dissimilar to sonar on a submarine. They detect foliage and turn the nozzles on and off so you’re not spraying the gaps. In young olive groves vegetation sensors can represent significant chemical savings making it well worth closer consideration. The new Hardi HC3500 computer controller provides for section control, applications rate control and vegetation sensors control all in one display. It is easy to mount, set up and gets rid of that cab clutter. Another nice feature is being able to grease the though shaft uni joints without having to pull the sprayers apart, which should save some time on those mundane tasks. The optional ChemFiller can be attached to help mix and transfer chemicals so you don’t have to climb on the tank and get covered in it.